There is something about waking up in the desert after a night of sleeping under the stars that is quite unreal. Seeing the shafts of sunlight breaking on the towering cliff walls that surround the desert base camp is something that I would never tire of. It was the start of another new day in the wilderness. We spent two days relaxing in our desert home after a busy time of building the protective walls. 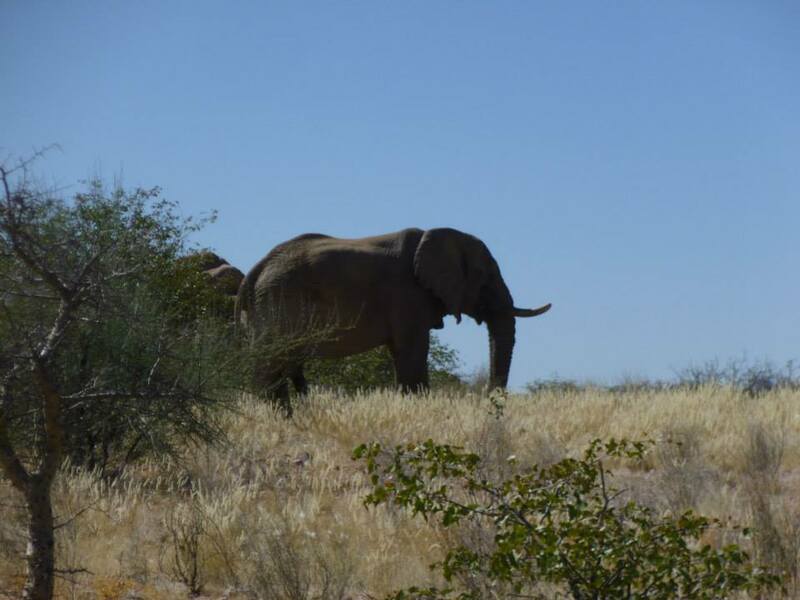 I was excited for time to pass so that I could get tracking the wild elephants in the desert, however I was also delighted to simply pass my time enjoying the sunshine, climbing the rocky hills surrounding the camp and chatting with fellow volunteers. Each day would come to a close with a short walk up one of the hills to watch the sun set over the desert with an ice cold beer. After what felt an eternity because of my excitement levels, the day dawned bright and chill for our tracking expedition. Rumours had been circling from local farms that the wild elephants were very close to our camp, so we had a warm trail to follow. We were off! 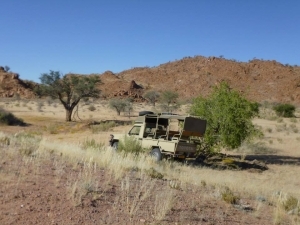 Bumping along the roughly hewn desert roads is certainly exhilarating on its own, but when you are hot on the trail of wild elephants it is even more of a thrill. After about 20 minutes we reached the dried out river bed where the most recent local sighting had been reported. Dried elephant dung and enormous footprints the size of tennis racket heads crossed over the river at that point, instantly indicating the direction for us to follow. Mattias, our guide, spent time explaining how to know from the footprints the way that the elephant was going, and to know how many elephants there were. We were following two bulls! We drove up along next to the riverbed, eagerly looking left and right for the signs of an elephant; in the dense greenery, this would be something like a bush swinging or huge dust clouds coming up above the treeline. Nothing. Mattias drove us around in a calculated pattern (always following the tracks) and would stop next to a lofty hill which would give us a good vantage point over the area. Despite his age (63) he would leap out of the truck and run up the rocky hill much faster than any of us younger stragglers. Once at the top, we would use the binoculars to scan the area to see if we could identify an elephant sighting. The views were stunning out over the desert and could really take your breath away. Mattias told us the directions in which the local farms were, and so could guess in which direction the elephants might have gone. His excitement for finding the elephants was palpable- and highly contagious! What amazed me was how fast the elephants could move. One hour later we were still following the elephants, and we found that their tracks had crossed over our own car tracks that we had left about 2 hours previously- and yet we had not yet seen them! Elephants on a mission can move quickly even at a walk, and they were still a long distance from us! One of my favourite parts of patrol, aside from the excitement of tracking the elephants, was stopping and seeing more of the local area. 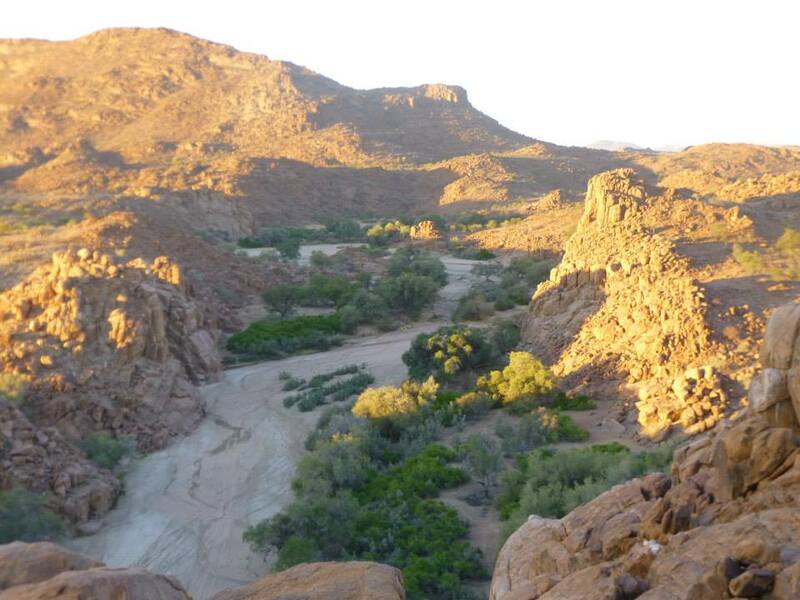 From each hill that we climbed we had amazing views out over the Namib; whenever we drove through a farmstead or a rural community we were greeted by the locals and given a fascinating insight into their way of life. The lifestyle is so different to anything that I could ever have imagined, and it was a real privilege to be able to experience it. After another hour of carefully tracking the elephants, we passed through a farm where the workers waved at us excitedly- the elephants had just passed through. Slowly we continued, until through the bushes a few hundred metres away we saw the looming grey mass of a bull’s bottom. He was standing quietly beneath the shade of a leafy green tree, and was slowly stripping the branches of their leaves. We approached slowly and parked up the truck in an area well ahead of him; Mattias wanted him to become used to our presence from afar, so that he would be comfortable to carry on as normal with us in the vicinity. Soon the mighty bull elephant had completely forgotten that we were there, and moved on from his tree to another more succulent grazing ground. It was then that I saw how majestic this creature was. He was huge, with two enormous tusks that were fully intact. The feet looked even larger up close, and the sheer bulk of him stopped me short for a while. We spent an amazing half an hour watching him graze, and soon he came very close past our vehicle on his foray for more food. That was when we saw his companion; another bull, less enormous but no less impressive, was grazing quietly a short distance away. The two elephants aligned themselves and continued to graze in comfort together rather than independently. My taster of tracking elephants was something that I will never forget. I have been lucky enough to see elephants in countries such as Tanzania, Thailand and South Africa, but these have always been in reserves or in sanctuaries. Never before have I experienced that wonder at witnessing a wild animal in its natural habitat, where it is being protected and allowed to live as it should. The experience brought tears to my eyes, as it is just such an exciting concept to be working in conservation at such a grassroots level, doing everything possible to ensure that elephants can remain in the wild in the desert. I left Namibia with a heavy heart, and an insatiable desire to return once more. To experience this incredible country and worthwhile programme for yourself. Visit our wild elephant conservation webpage.